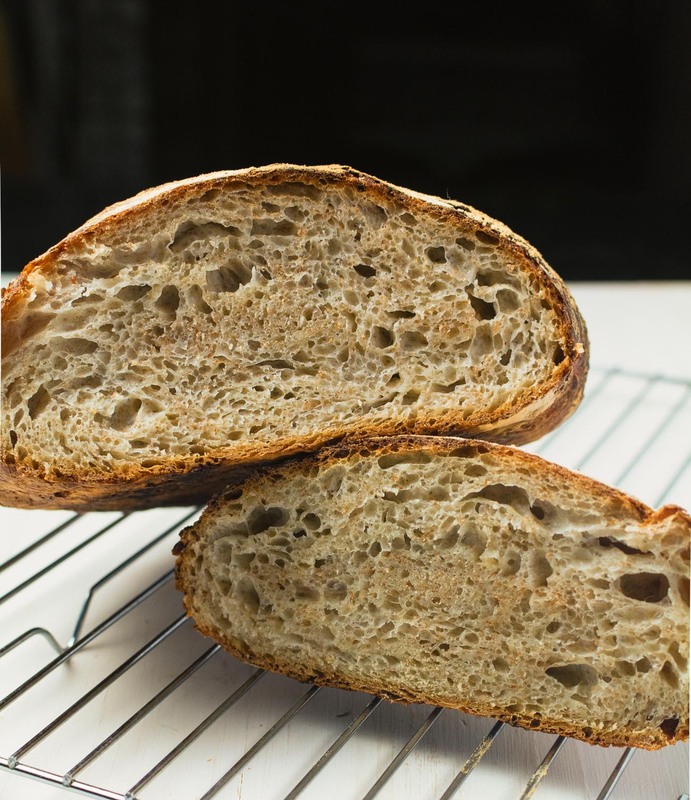 There’s a super popular article in the NY times by Mark Bittman about Jim Lahey’s no-knead bread. I looked at it, saw the pictures and thought I’d give it a try. The beauty of this recipe is it teaches the benefit of longer fermentation. 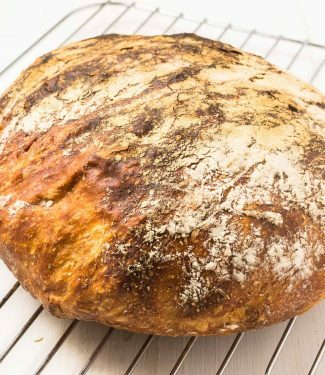 This no-knead bread takes about 24 hours to make. Time is a wonderful thing when making bread. Complexity happens. Depth of flavour results. The recipe, as written, is a bit vague. And a bit dangerous. The video has you throwing raw dough into a blazing hot dutch oven. There are holes in the recipe as well. You need to read the comments to understand what is really going on. Here’s the no-knead bread recipe with the benefit of the comments woven in. First off, measuring flour by volume is misguided at best. Bread bakers work by weight. I don’t know what the obsession is with volume is but if you are going to make bread or pizza dough do weigh your ingredients. Maybe professionals can stick their finger into dough and know it’s right. I can’t. Second, understand that proofing is a function of time and temperature. The warmer the room, the faster things happen. The recipe, as written, is for about a 70F room and a 12 to 18 hour initial proof. The real way to tell how your doing is to watch the bubbles forming on the surface of the dough. Bubbles means it’s good to go. Third, tossing the dough in a 500F dutch oven is crazy. I do the second proof with parchment under the dough. When it’s time to bake, I pick up the dough by the parchment and carefully drop it into the dutch oven. Cover it up and into the oven it goes. Safe. They don’t explain why the dutch oven is important. Professional bread baking ovens maintain high humidity in their ovens. Inject steam in fact. Thomas Keller suggests heating metal chains in the oven and spraying them with water to recreate this. Modern thermostats don’t like that so I don’t recommend it. The dutch oven acts as a moisture trap. The steam that escapes from the dough humidifies the interior of the dough. This allows the bread to rise before the crust sets up. And they don’t talk about the temperature of the bread. Bread is done at around 205-210F. You can’t tell by looking at it. The whole hit it on the bottom and listen to the sound it makes theory I don’t get at all. This makes a pretty good loaf of bread. Not the best I’ve made and certainly not the best I’ve had but pretty good for the little bit of work it takes. 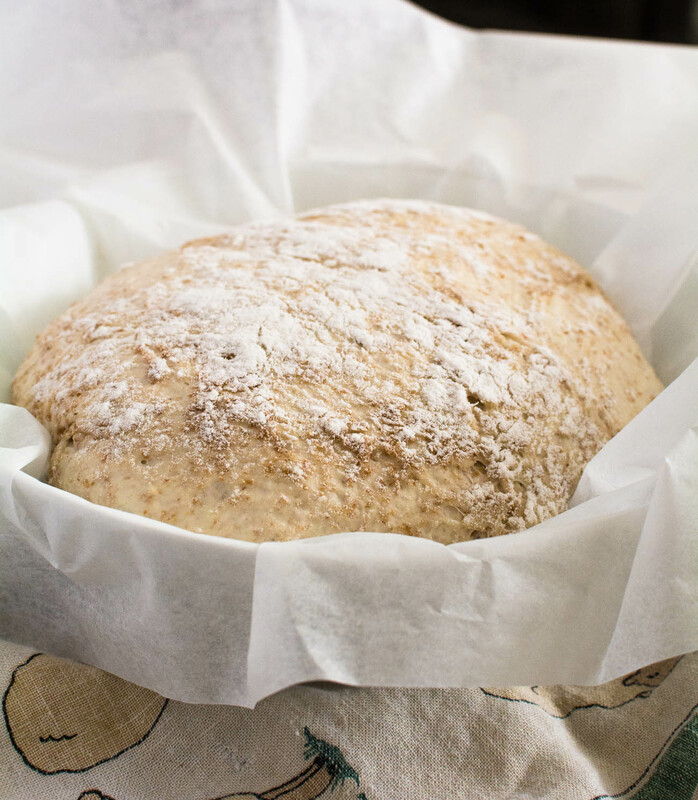 It’s a great introduction to bread making – once a few little gaps are filled in. This is a more detailed description of the NY Times Mark BIttman no-knead bread article. It replaces volumetric measurements with weights and offers a couple tips on safety. Combine flour, salt and yeast in a large bowl. Add water and mix using your hands. This is a sticky mess. Cover with plastic wrap and let rise, undisturbed, for 12-18 hours. It's ready when you see little bubbles forming on the surface of the dough. Cut a piece of parchment about 14 inches square. Sprinkle with a bit of flour. Flour your hands. Slide the dough out of the bowl onto the parchment. Fold the dough onto itself 4 times. You are taking one side of the dough and folding about 1/3 of the dough onto itself. Now do it on the other side. Rotate everything 90 degrees and repeat for the third and 4th fold. Watching the video in the link helps understand this. Flour your hands some more and flip the dough over so the folded side faces down and the smooth side is up. Try to shape the dough into a ball as best you can. Place the dough in a bowl to help it keep its shape. Flour the surface of the dough and place a tea towel over top. It's sticky, sticky dough so don't let the towel get too stuck. Place a 5-6 quart dutch oven in the oven and pre-heat to 475F. After about an hour remove the dutch oven and transfer the dough into the dutch oven using the parchment as a cradle. The parchment goes into the dutch oven along with the dough. Be careful here. The dutch oven is screaming hot. Cover the dutch oven and return it to the oven. Bake for 30 minutes. After 30 minutes remove the lid and cook for an additional 10-20 minutes. You are going for an internal temp of about 210 degrees. When the bread is cooked, remove and transfer to a cooling rack. Let stand about an hour. Slice and be impressed with yourself. You’ve added some great tips and commentary to this recipe. First of all, buying a kitchen scale was the best thing I could do for my baking. I wish more recipes were by weight, it would eliminate a lot of surprises. And thanks for the tip with the parchment. A 500 degree dutch oven and my clutzy self are a bad combo – anything to make it safer it a plus in my book. 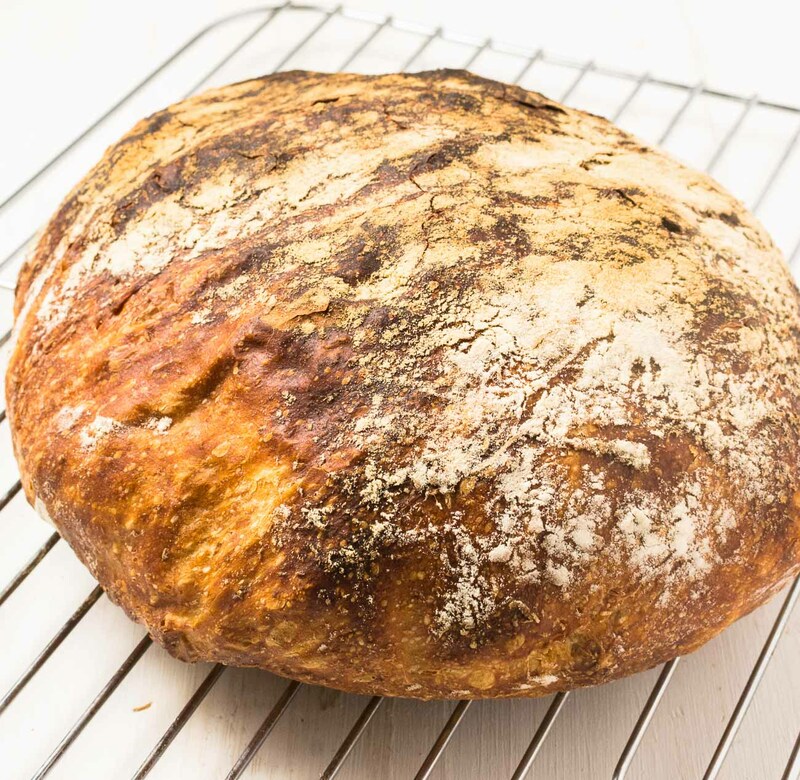 This no-knead bread recipe is fundamentally a good one. It just needed a few things explained a little better I think. Hope it works out for you. Vague and bread making are a pretty bad combo. Hope you like it. Be careful o that dutch oven. That metal is HOT. I’ve seriously been wanting to make bread similar to this for years and have just not gotten around to it. I’m inspired! Love your info about temp testing the bread to know when it is done, no guessing! Do you think my 9 quart dutch oven would work ok for this recipe? In this case I don’t think bigger is better but I don’t really know. The volume of the 9 quart will reduce the moisture concentration but I have no idea by how much. Guess you’ll need to try it to see. Food science research! I love homemade bread but I hate kneading. Definitely need to check this one out, and I really appreciate how you fill in the holes and gaps of the article! 🙂 I have made Lahey’s no knead pizza dough and it was really good but I really need to put on my ‘patience’ cap on for these eh? haha 🙂 Thanks again for the awesome teach, love learning from you. I’ve been tinkering with a nearly-neapolitan style pizza dough recipe. Don’t know if I will get it right but pizza is one of my favourites so I’d like to get it there. Good bread takes time. Good pizza dough too.